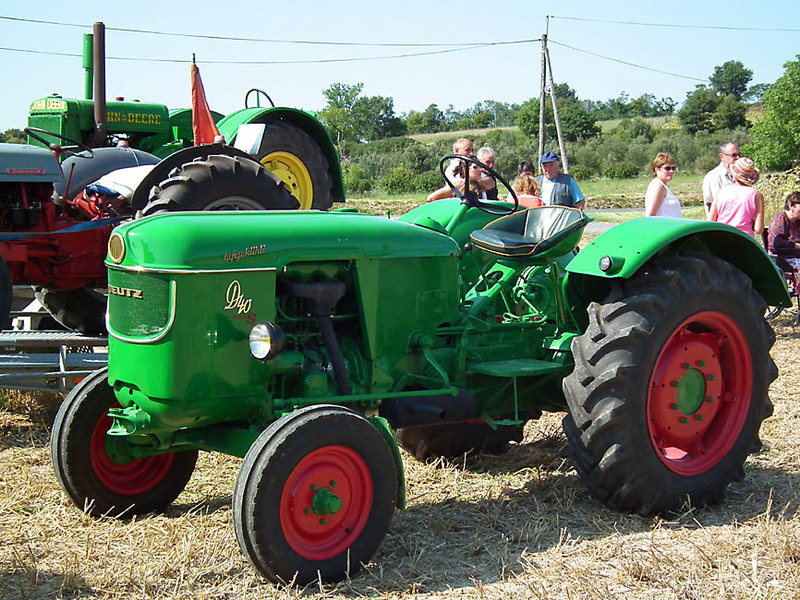 The recent Agricultural Show in Preuilly brought out all the local dudes. I have never seen him so smartly dressed. Usually he is in gardening gear and looks like this. 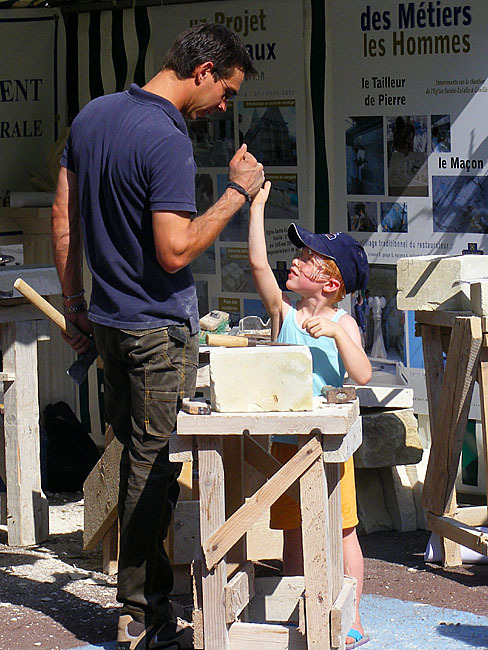 This young mason from Loches was teaching his son the trade. I think the son had just mashed his fingers with the mallet and Dad was checking if he was OK, without making a fuss. I love this photo and the interaction between father and son. Looking at my other photos of this pair it seems that Dad is right handed, but the son is left handed. 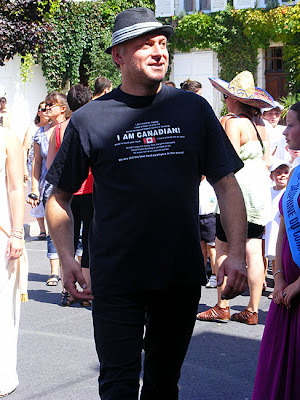 This is our friend and builder Stéphane. He has dual French and Canadian citizenship. The mayor (and our plumber). 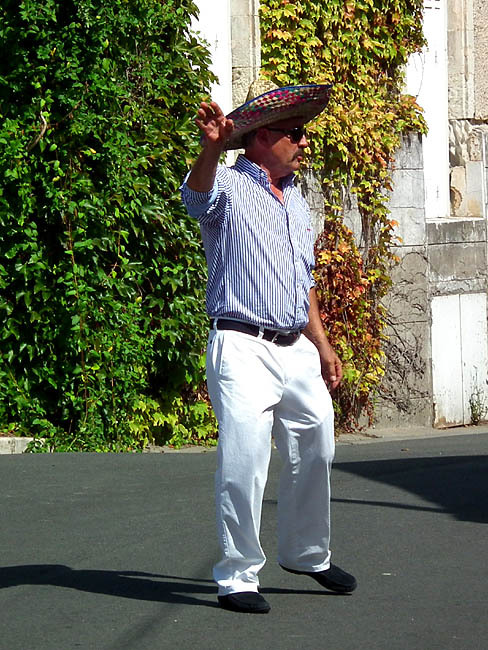 The day was so hot that sombreros were cool in a very real sense. 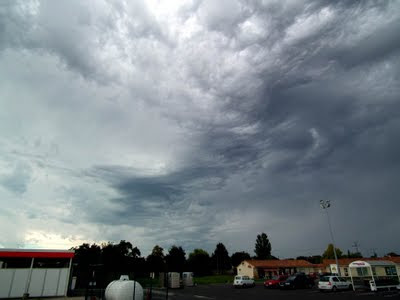 It's only been 27 months (840 days, to be precise) since we arrived in Preuilly sur Claise to live here. 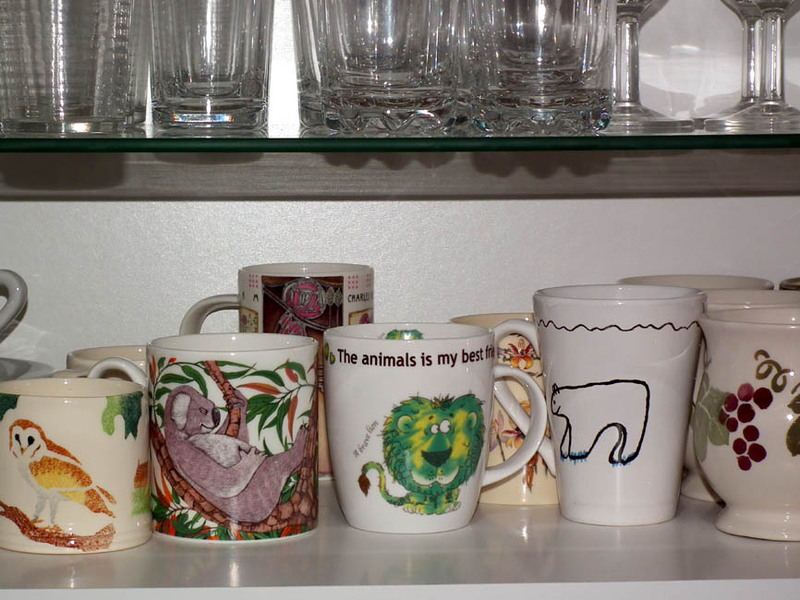 Yesterday living here took one big step forward, when we finally unpacked Susan's dinner service, the serving bowls, and the coffee cups. Amazingly, nothing has yet come out of its box broken, so the packing (which I wrote about here) appears to have been totally successful. 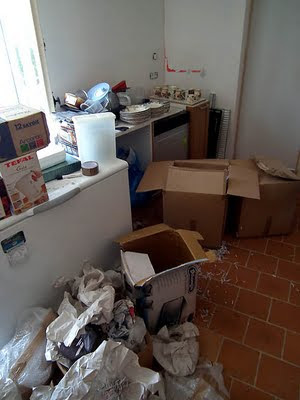 All the plates and mugs were individually wrapped in butcher's paper, then wrapped in lots of 4 plates in bubble wrap, before being put in a cardboard box padded out with shredded tax bills and bank statements. 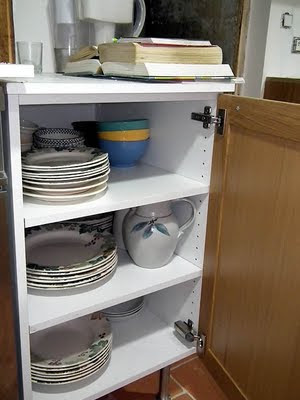 It all went from the boxes to the dishwasher for a 30 minute quick wash, then into the cupboards. We did have to have a serious house meeting about where stuff went, but we were both thinking more or less the same thing, so there were no issues to be resolved. *Actually no. These are a few of my favorite things. 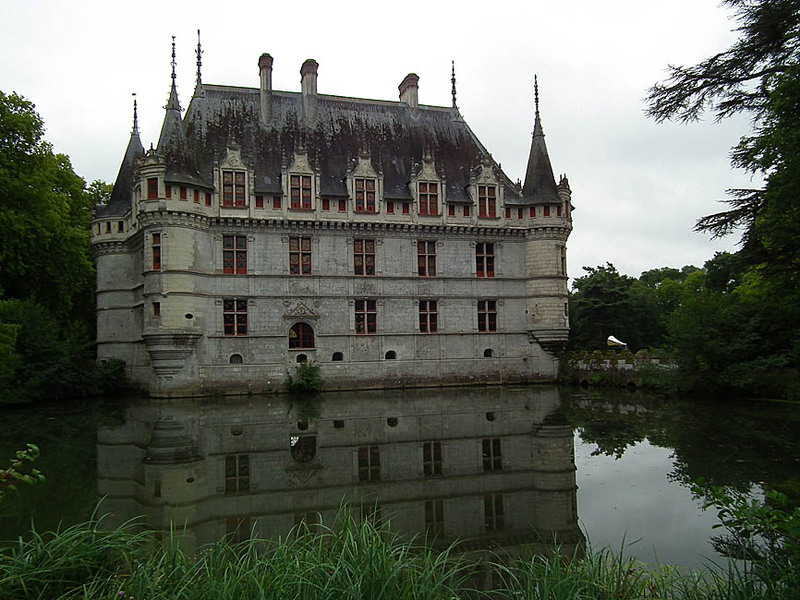 Le Château d'Azay-le-Rideau, floating on its mirror pool. Personally I think Azay-le-Rideau is one of the most beautiful of the Loire renaissance châteaux. It has lots of highly satisfactory decorative twiddly bits and sits on its island in the river as if it is floating on the water. 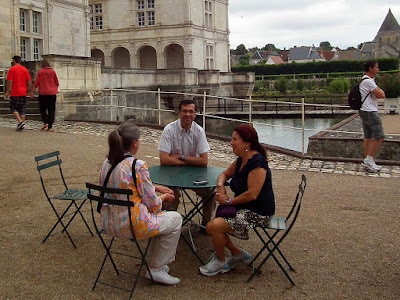 Although the smallest of the châteaux on the main Loire tourist axis it abounds in photo opportunities. It's a nice one to visit if you only want to spend an hour looking at châteaux, but equally, there are many fascinating objects inside and you can easily stretch the visit to two hours to see everything. Being a Centre des Monuments Nationaux site it has an excellent bookshop. It's not far from Villandry and many people combine the two for a day of châteaux visiting. I'm not sure if the carved initial is 'R' for Raffin or 'B' for Biencourt. The distorted glass gives the view a mysterious and magical look. This year has been a disaster for most of the Lycaenidae (Blue) butterflies here. Numbers remained low throughout the exceptionally dry spring and even with our relatively wet summer numbers have stayed low. 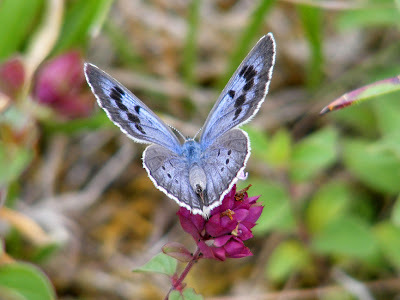 One of the few blue butterflies which appears to have done reasonably well (although never common, even in good years) is the Large Blue Maculinea arion* (l'Azuré du serpolet in French). The big blues Maculinea spp have a very particular lifecycle and ecology. Females lay eggs on the flower buds of the caterpillar host plant. Once hatched the caterpillar consumes the buds, hidden amongst the flowers for 3 or 4 weeks. Then, while still very small, it descends to the ground and waits to be adopted by an ant Myrmica spp. Once a suitable 'nanny' arrives the ant and caterpillar engage in a ritual which establishes their bond and the ant carries the little caterpillar off to its nest. The young caterpillar completely transforms the operation of the ant nest. Some Maculinea, the Large Blue included, devour the surrounding ant larvae, others just feed on the liquid the ant workers produce for their own larvae. The caterpillar overwinters in the ant nest, going dormant in time for the ants to resume their normal activity and ensuring the colony will survive until spring. Still underground in the ant nest the caterpillar transforms into a chrysalis in the spring. After it has hatched the adult butterfly must leave the ant nest rapidly, to fly free and ensure the reproduction of its species. This extraordinary lifecycle explains the extreme vulnerability of Maculinea populations. Their existance depends on a single plant within an area (very rarely will there be two host species on a single site) and a single species of ant which is essential for the growth of the caterpillars. The host plant must be at the beginning of its flowering season and not grazed or mowed during the egglaying period and the density of the ant nests must be such that the ants and the caterpillars have a good chance of meeting. And these plants and ants have their own ecological requirements. 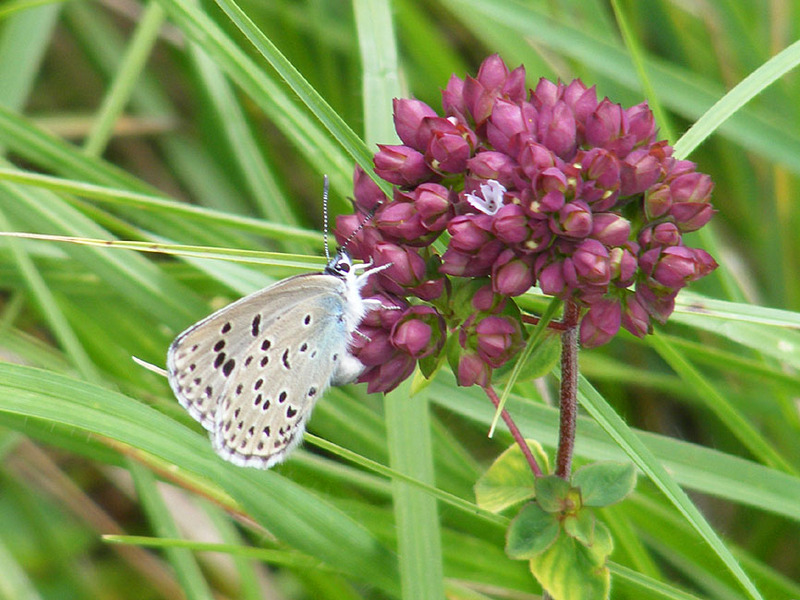 Large Blue ovipositing on Wild Oregano Origanum vulgare. Following a series of local extinctions, naturalists have brought to public attention the strong regression of Maculinea in Europe over the course of the last decades. British readers will no doubt be familiar with the extinction and reintroduction of the Large Blue there. Hopefully this flagship group of butterflies has been instrumental in influencing policy so that management systems that are sympathetic to insect lifecycles and ecology are more widely practiced. If not, the continued survival of these remarkable creatures cannot be guaranteed. Here in the Touraine we are very lucky to have 3 species of Maculinea present - Alcon Blue M. alcon (l'Azuré des mouillères); Large Blue M. arion (l'Azuré du serpolet); Scarce Large Blue M. telejus (l'Azuré de la sanguisorbe). The Large Blue in the photographs was photographed this August in the field opposite our orchard. *Syn. Phengaris arion, Glaucopsyche arion. When we had a client in July who only wanted to see gardens, we got in touch with some of the gardens to try to set up meetings with the gardeners. At Villandry they went one better for us, and Henri Carvallo, the owner, very kindly gave us half an hour of his time. He was lanky, diffident and clearly very conscious that it is the visitors that matter at Villandry. Sue and I talking to Henri Carvallo. He told us that at Villandry the entry fee covers the work in the garden and that the place does not get any sort of government grant. 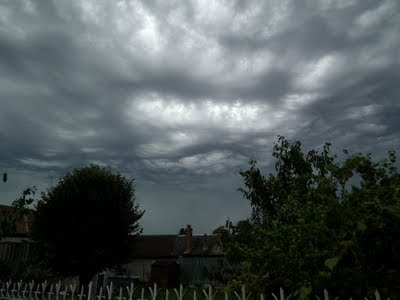 I know from my time working at the National Trust in England, Wales and Northern Ireland that this is extremely rare. It is very difficult to set an entry price that the visitors are willing to pay that actually covers the wear and tear on the site as well as regular maintenance and improvements. This is a real testament to Monsieur Carvallo's experience and skill as the owner and manager of the site. The garden is now fully organic and employs 9 full time gardeners and some apprentices. Some of the plants, such as the step-over apples that 'fence' off the potager plots, are not grown on site, but supplied, already trained, by specialist nurseries in Germany. Monsieur Carvallo's attitude is that they can't be expert at everything at Villandry, and these types of plants are best produced by really skilled hands that do it every day. 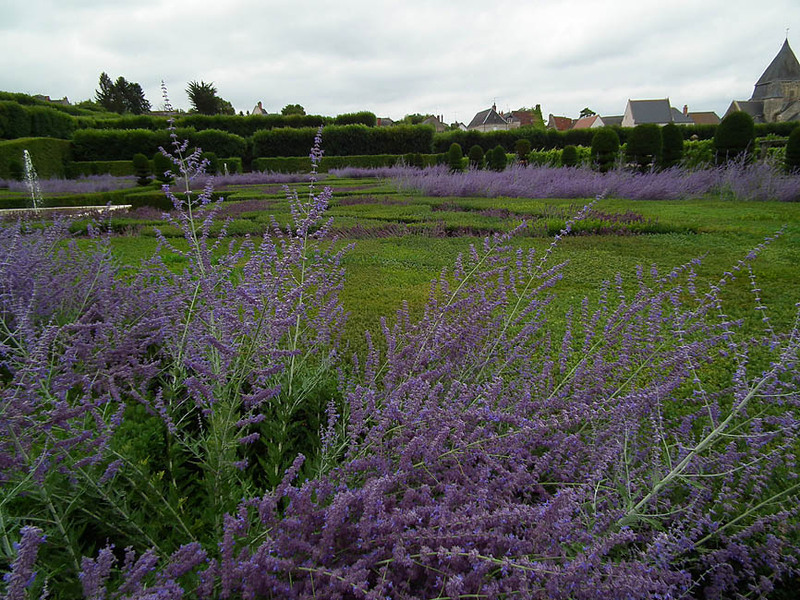 Other plants come from the big French nursery Delbard. The lovely canal bordered by vine covered walkways. He has recently been appointed to an advisory board for Longwood in Pennsylvania. No doubt they will benefit greatly from his input, and he confided to us that he wanted to pick up a few tips on customer service. 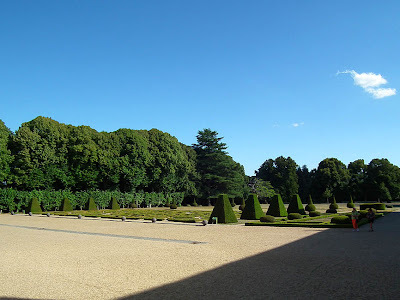 There doesn't seem to be anything much wrong with the visitor service at Villandry, but Monsieur Carvallo believes that America leads the way in this field and that he can gain valuable insights now that he will be regularly working with a major American garden. significant, given the white stone fountains? 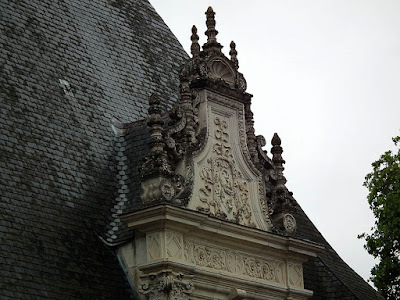 Monsieur Carvallo told us a little of the history of Villandry and how his family came to acquire it. I knew his grandfather* was a Spanish medical research scientist, but I hadn't realised his grandmother* was an American coal heiress from Pennsylvania and also a doctor. Apparently at the outbreak of the Second World War she ran the Stars and Stripes up the flagpole, because she thought the Germans would leave them and the garden alone if she clearly identified with the US (which was neutral until later in the war). *Monsieur Carvallo referred to his 'grandparents' but many websites say 'great-parents'. The roof timbers in the stables at the château d'Ussé use a very similar bracing system to the timbers in our attic bathroom - the soi-disant St Andrew's Cross. Unfortunately I can't find anything about the construction of the stables at Ussé. Although it's probable that our house and the chateau are contemporary (15th century) the timbers in the stables look much less rough-hewn than ours. 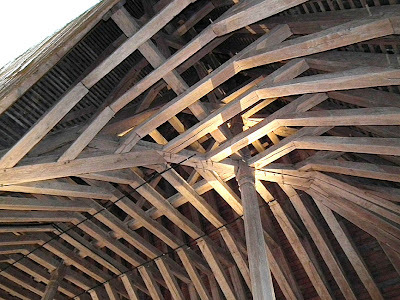 It's very difficult to judge sometimes, but Stéphane thinks that the timber in our roof is of several different ages and has been reused from an earlier construction. 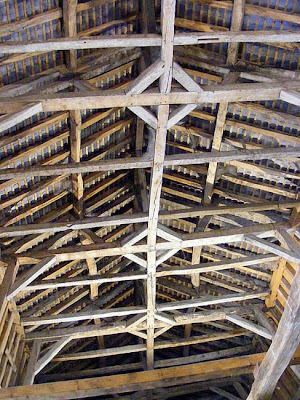 The stable roof at Ussé. 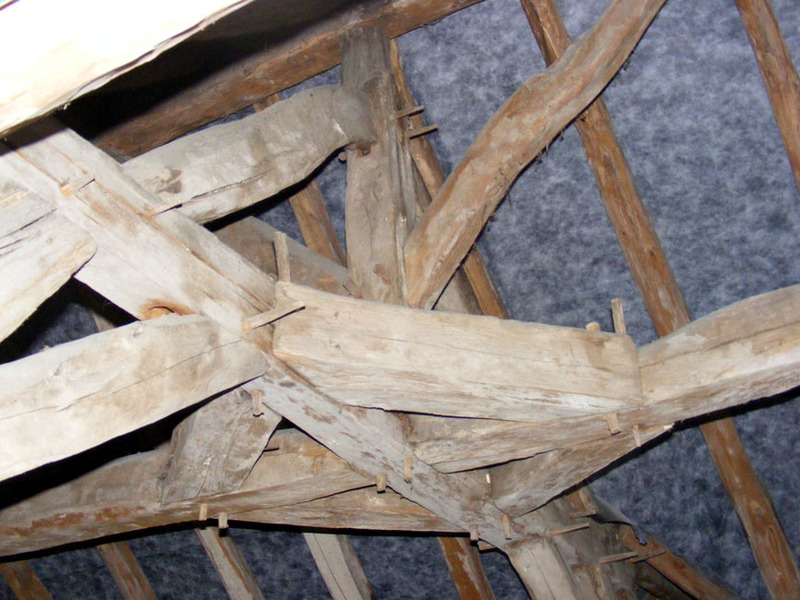 You can see a picture of our roof timbers here. Our friends Chris and Annie were recently given the remains of a feral honey bee nest that had been cut down from a bush in their neighbour's yard. Annie installed it in her studio and was intending to paint it, but hadn't realised that something still lived in it. To her dismay the walls and furniture where covered in dozens of grubs within hours of it coming inside. Chris had to very swiftly encase it in a bin bag and deposit it outside, whereupon the grubs chewed through the bottom of the bag and 'legged' it. I was sorry to have missed the little blighters so I could identify them, but I suspect they were some sort of kleptoparasite, living off the bees' waste material, or the poor abandoned bee larvae themselves. Feral honey bee nest (upside down I think). I imagine that many people think of Honey Bees as wild creatures, but Apis mellifera, or Hive Bees, as some scientists and apiarists prefer to call them, are a domestic animal, having been farmed and breed by man to provide honey for centuries. They are also used by commercial orchards as pollinators, but since many wild insects perform this task effectively, Honey Bees real economic importance is as honey producers. Here in central France there are many apiarists and groups of Honey Bees inevitably go feral from time to time. It is quite common to see Honey Bees congregating around hollow trees or delapidated chimneys. They've escaped the management of the apiarist and are living in the wild. If you have them nesting somewhere problematic, contact a local apiarist and he or she will most likely be very happy to come and return them to the fold. 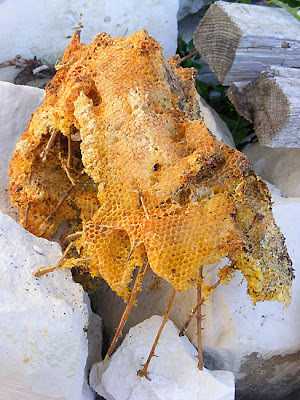 Luckily feral Honey Bees don't cause the sorts of environmental problems that feral cats or goats do. A Honey Bee, working over a thistle yesterday. In Europe and America there is great concern over largescale Honey Bee deaths in the past few years. Apiarists are worried that their livelihoods are seriously threatened and the press are only too happy to sensationalise. Einstein's supposed quote about us only having 4 years if the bees go is regularly trotted out. The reality seems to be that, globally, Honey Bee numbers are increasing, mainly thanks to the Chinese taking up industrial scale honey production. 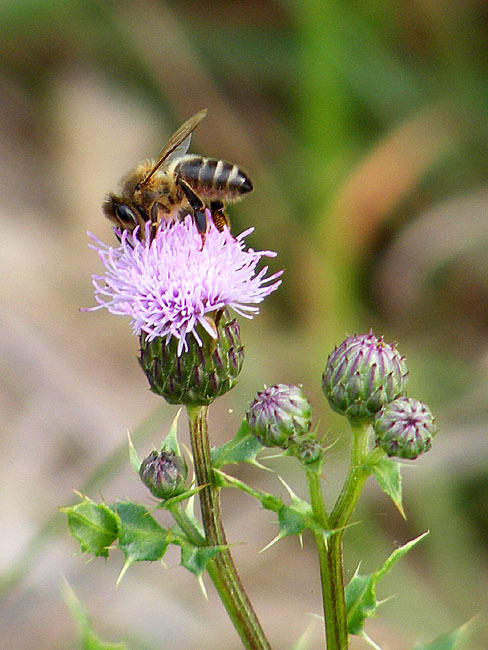 Only 6% of food crops require the input of Honey Bees to provide a pollination service. Cereal crops, for instance, are wind pollinated. The latest research shows that the causes of Sudden Colony Collapse Disorder are a combination of a hive already infected with both Nosema (a fungus) and iridovirus, triggered by some additional adverse weather stress. We last spoke about the small bathroom over a year ago, since then we have been using it, but it hasn't really been finished: like most of these things the room was needed and pressed into service once it was usable, but before all the teas were dotted and eyes crossed. 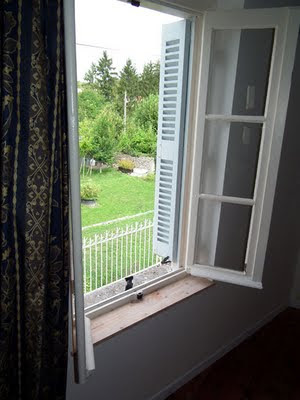 Likewise the guest bedroom: the skirting boards need painting and the door has to be adjusted, but at least we have now put in the interior window sill. Slowly slowly we are getting there, but it's amazing how much disruption doing these final little tasks is causing. At the moment we dont have an upstairs toilet, and because we had to move the toilet we can't access the shower, and once we start painting we won't be able to use the spare bedroom for a week, the house will stink and we will have yet more dust to add to the dust caused by boxing in the stink pipe. 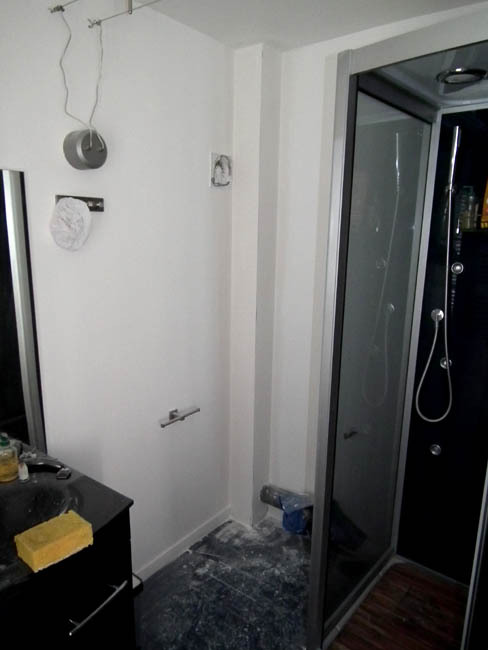 I may even give the bathroom floor its final coat of paint before putting the toilet back. 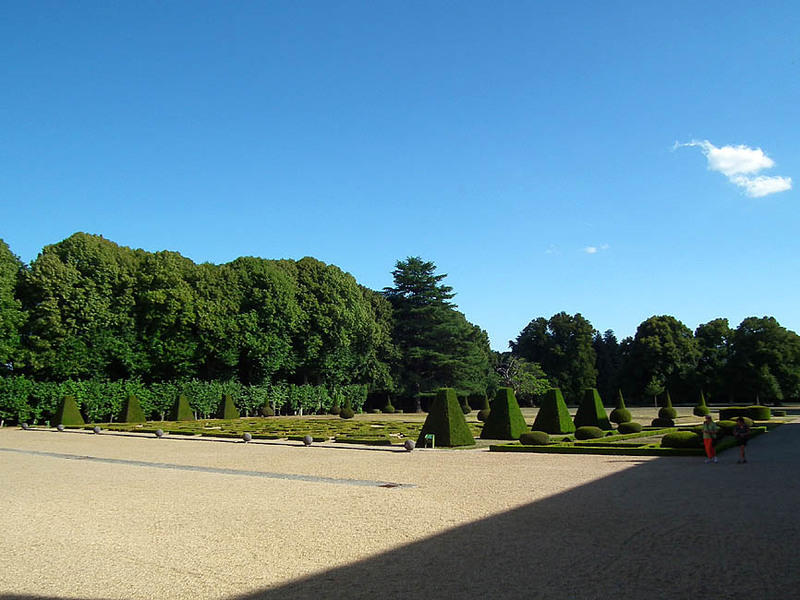 The park at the château of Azay-le-Ferron was designed by the Buhler brothers in 1856. It consists of 18 ha of tree lined alleys, more than 300 rose bushes, an arboretum, a collection of rare and heritage fruit trees and lots of topiary. 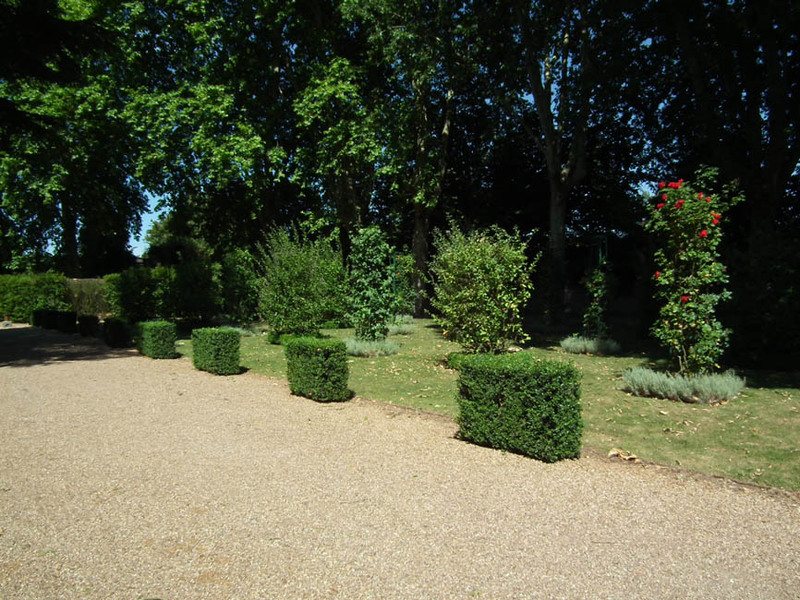 In 2010 it was officially classed as a Jardin Remarquable. It's only just down the road from us, but we don't take nearly as much advantage of it as we should. For more views, see our blog posts here and here. Another movie, this time of yesterday's parade. It has been really hot the past couple of days - mid to high 30's and very humid. After I went to bed Saturday night (3.00am, it was so hot!) we had a proper thunderstorm, but the morning was clear again. That only added to the humidity, which meant that people in folkloric costume were really struggling. After the parade we went to the plan d'eau, where there was more folk type dancing, but it was too hot for us, with very little shade, so we came home early. Beer (not pictured). It was almost 30°C at midnight, so the Pompiers' beer tent was raising plenty of funds - as is only right. 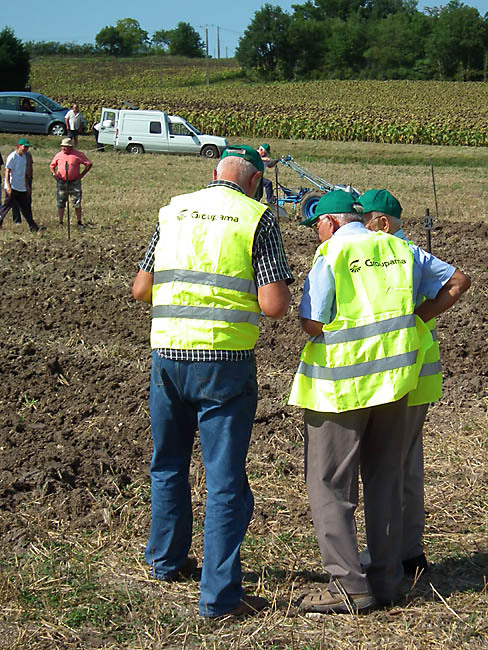 This weekend the Comice Rural is being held in Preuilly sur Claise. 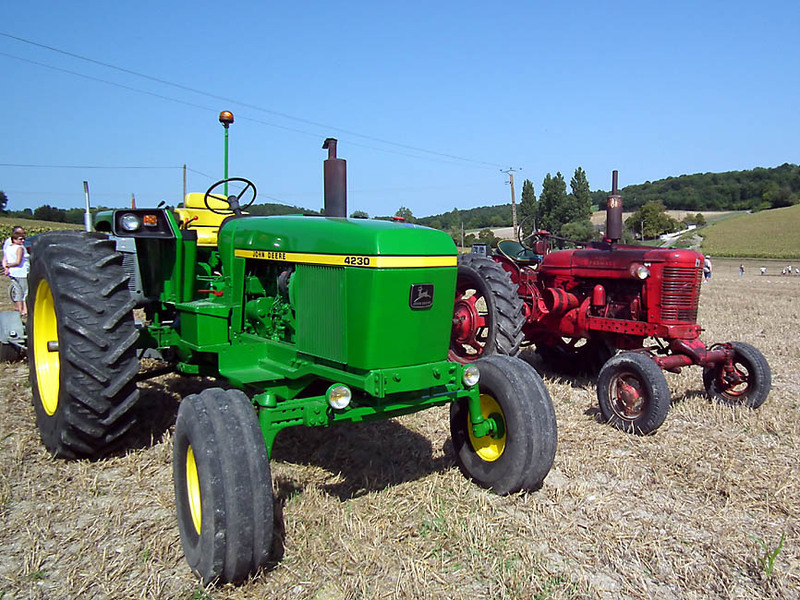 Yesterday's main event was the concours de labours (a ploughing competition) and an open air cinema at the chateau at Boussay. Today there are plenty of events: an exhibition of animals, local businesses on display, an organic food market and a sideshow alley. 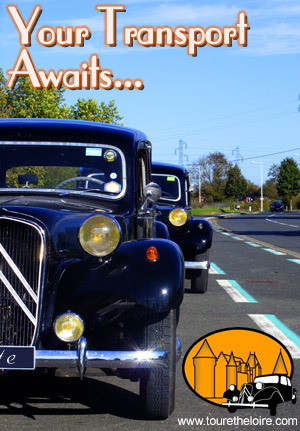 Later in the day there will be various races (foot races this time, I don't think there will be any cycling), and at 23.00 fireworks and a bal populaire. Tomorrow there is a grand parade at 14h with lots of folkloric stuff from around the country and "la Reine du Commerce et ses Dauphines" - The Show Queen and Princesses. 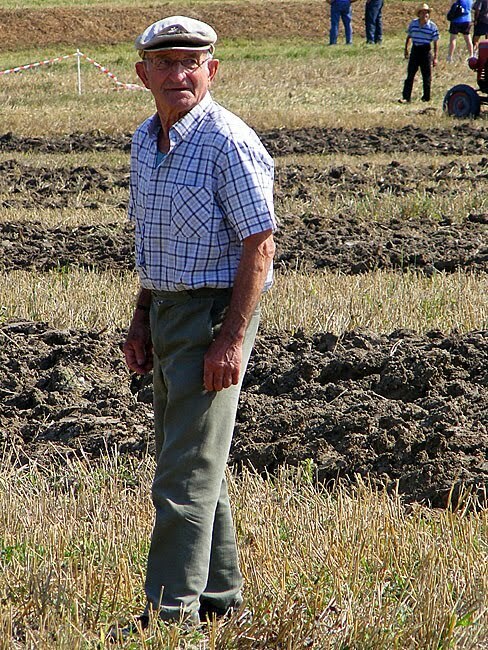 We went to the ploughing competition yesterday, which was interesting, but very hot and humid. As with most of these things the details are a mystery to us, but we know people are judged on straightness and evenness of depth of the furrows. What else constitutes a winning run is beyond us. By the time we arrived the hand ploughing (roto-tilling) competition had finished and the competitors were rehydrating in the beer tent, whilst the Tractors Ancient and Modern were still working. Not all of the tractors were in competition..
Today and tomorrow we are promised temperatures in the mid-30s, which is a startling change from the wet grey and miserable weather of only a week ago. 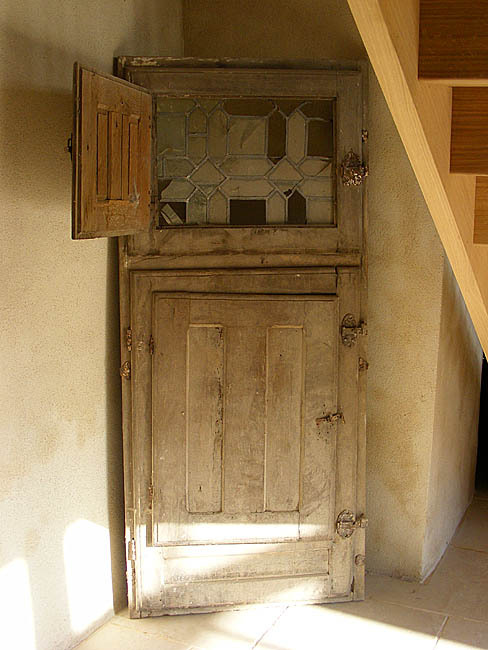 Our friends Chris and Annie, like almost all our friends, are in the process of doing up a dilapidated old French house. 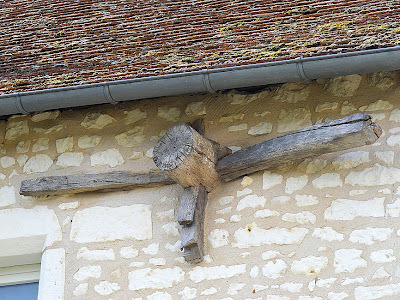 I took the opportunity to take a few photos of a couple of their intriguing and interesting architectural features. Like us they have had the impetus this year of family visiting to cause a big push. The house has come on amazingly since we last saw it. We are tremendously impressed with all the beautiful detail they are adding. 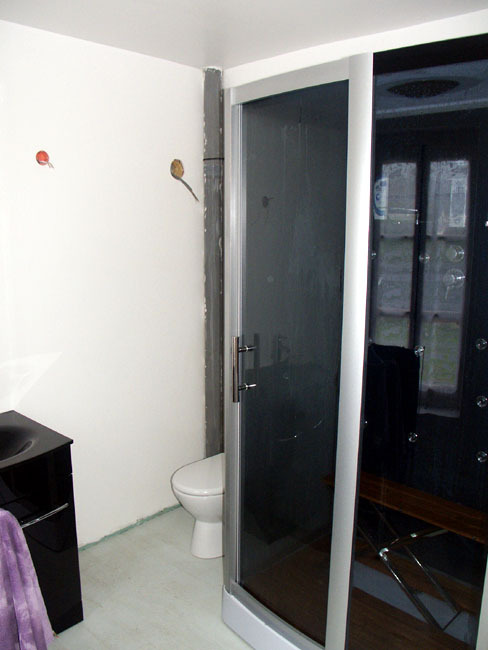 They've had the fun of commissioning a staircase, choosing colours, designing a stylish new bathroom just like we have. It's always fascinating to see how other people approach these projects, and as usual I came away impressed by how beautifully some people can arrange a room or choose objects. I'm always too conscious that decorative objects need dusting, and since I don't dust, I tend to avoid ornament. But it was some of the old detail that really caught my attention. 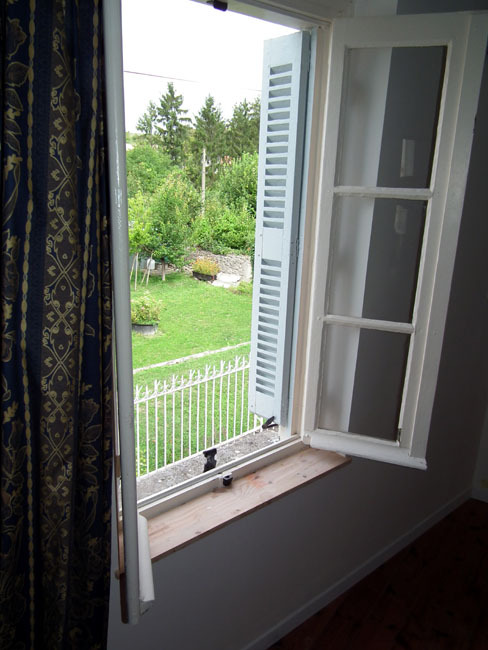 The shutter and leaded window unit which they think must have come from the back of the house is like a scaled down version of those at the château d'Azay-le-Rideau. They are beautiful, complicated things, multi-layered so you can open all or part. I suppose they are 19th century copies of a 15th century style, but I'm not really sure. At the front of the house is an extraordinary 'Heath Robinson' affair which we presume is some sort of tie to stop the walls spreading. Now that the house has some more or less finished rooms, Annie is starting to put some time into the garden. 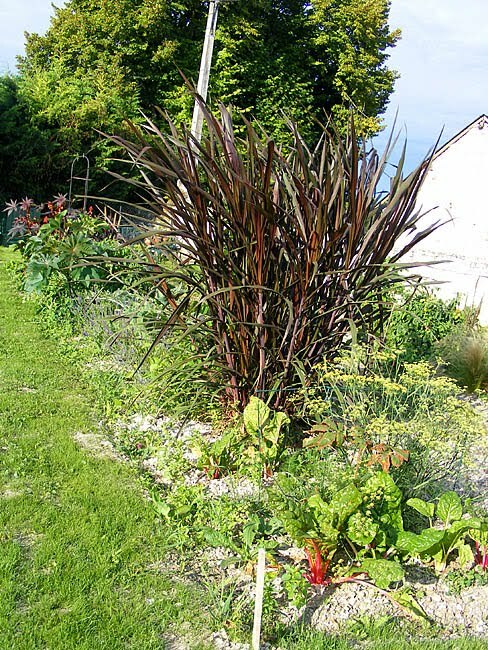 She is a botanical artist, so the long border has a series of plants that will make good subjects - sugarcane, castor oil plant, crimson artichoke and other unusual specimens. Chris is a great cook and thanks to them we have matching Italian range cookers. He has been using his for a bit longer than me and is now tackling the grill. Apparently it is ferocious, but his grilled mozzarella on baguette with lardons was delish. I haven't attempted anything under the grill with ours although I have successfully used the oven several times. When we left Annie gave us a jar of homemade Cornelian Cherry jam. They have a tree at the front of their yard which produced hundreds of shiny oval red fruits in July. Their neighbour told them the fruit made excellent jam, so they tried it. It's a sharp sweet flavour that went very well with the lime sorbet they served at dinner. Cornelian Cherry Cornus mas (Cornouiller mâle in French) is a type of dogwood native to central Europe. It forms a small tree, growing on chalky soil, with yellow flowers appearing before the leaves in February or March. Not to be confused with the dogwood native to this area, C. sanguinea, which is a shrub with reddish stems and white flowers in early summer followed by black berries. It seeds and suckers along all the roadsides, hedgerows and fencelines, becoming a bit of a nuisance for gardeners. On Tuesday we were working with clients based in Chinon, so on the way home we called in to see our friends Chris and Annie, who very kindly invited us to stay the night. Over breakfast yesterday morning we all commented on how clear and blue the sky was, thus proving the weather forecast (rain, thunder, lightning and quite possibly the end of the world) wrong. Fifteen minutes later we were less confident, as we realised that the rumbling noise wasn't trucks on the road, and the horizon was dark grey rather than blue In order that we should get home before trouble arrived Susan and I hotfooted it outta there so as to miss driving in the rain in Célestine. On the way we had to stop for fuel in Richelieu which was where we noticed the clouds had got interesting. 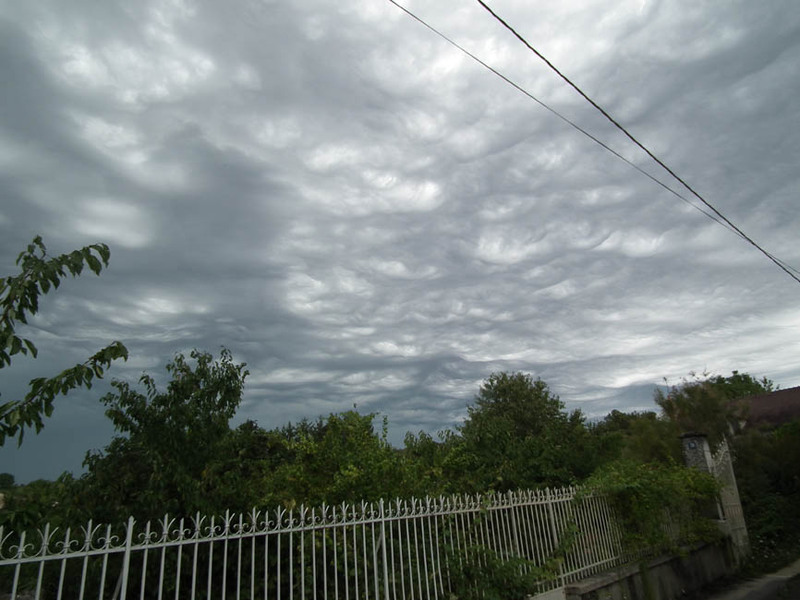 About an hour after we arrived home the clouds caught up with us, so there was a second round of taking photos and hoping they might actually show what we could see. Although the sky was ominous we missed out on any damaging weather. We did get a heavy shower or two in the early afternoon, but the evening was clear, blue, hot and humid. 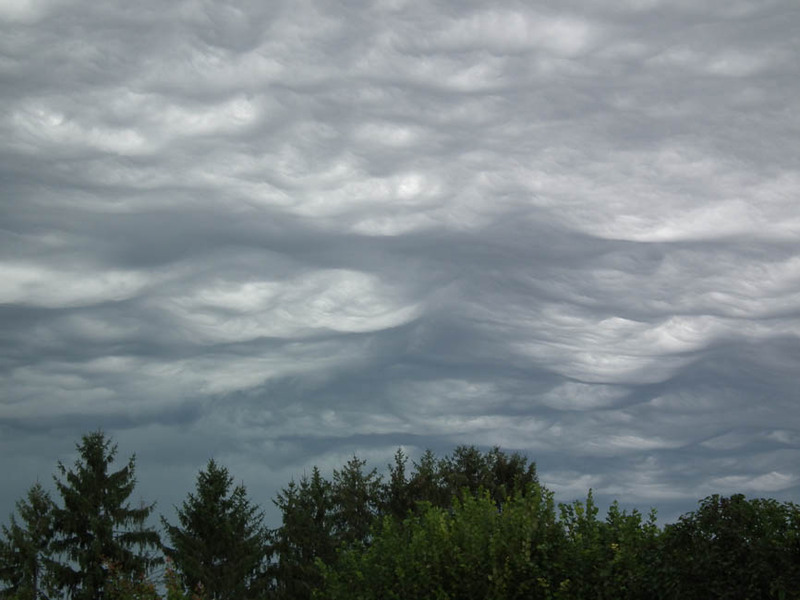 All of the photos will enlarge if you click on them - it really was the most sculptural sky we have ever seen except in the movies. The photos don't quite do it justice. 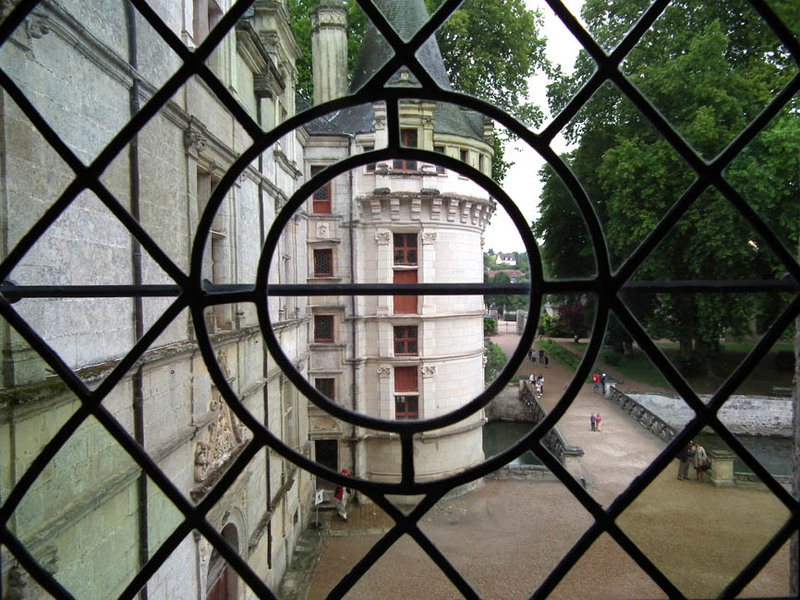 In the 15th and 16th century the high quality of the stone quarried at Bourré meant that it was used in the construction of great châteaux like Cheverny, Chinon and Chambord. By the 19th century there was a network of hundreds of kilometres of galleries, on multiple levels. 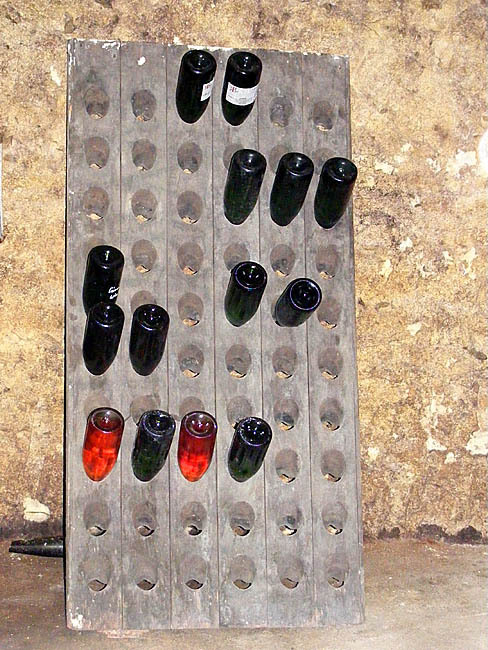 The owner of one of the principal quarries started growing button mushrooms in worked out galleries as a sideline, and his family still own and operate the Cave des Roches. No more quarrying goes on and very little button mushroom cultivation. 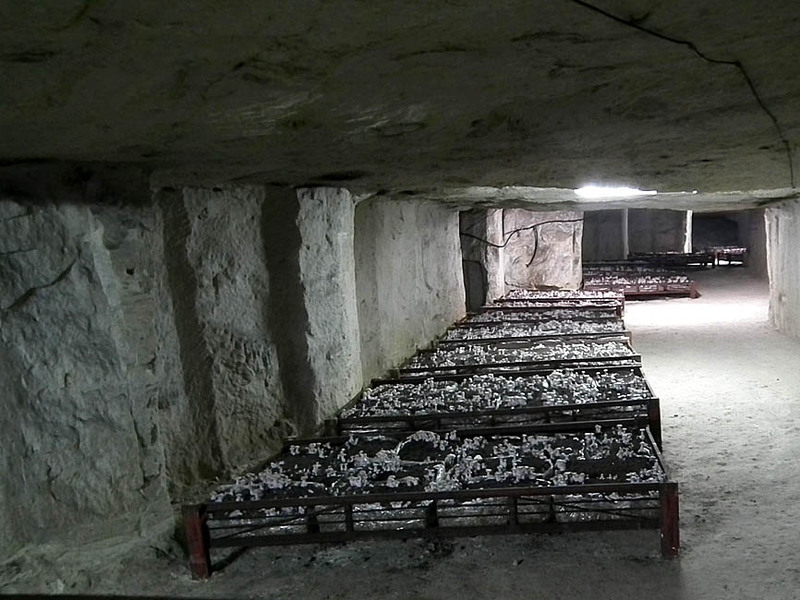 Once there were hundreds of caves in France producing mushrooms - now there are just 30. In the 1990s new accelerated growing methods for button mushrooms were developed and many tonnes began coming out of Dutch greenhouses. The Delalande family at Bourré couldn't compete, so they decided to switch their production to more unusual gourmet varieties of mushrooms. Today they grow pied bleu, shitake, chestnut and grey and yellow oyster mushrooms which are sold to Michelin star restaurants all over the world. They also open the caves up to visitors. Crates of mushrooms growing in the cave. In the 1930s the Cave des Roches was producing 200 tonnes of mushrooms a month and employed 50 people. Now they employ just 6 and produce 100+ tonnes a year, all harvested by hand. The caves provide the ideal atmosphere for mushrooms. Initially the inocculated growing media are kept warm in incubation units until a sufficiently robust network of mycelia (like roots) has developed. They are kept damp and then they are taken out to the cooler environment of the caves. This combination of warmth and water followed by a cold shock triggers fullscale growth of the fruiting bodies, which are the bit we eat. While growing they remain at a steady 12°C and are naturally ventilated by the chimneys which provided air for the original miners. Moisture levels in the air are very high. Each of the varieties grown requires a slightly different approach. The costs of production vary from about €5 per kilo to €10 per kilo, but add the cost of transport, storage, packaging, retailer's margin and so on, and the price trebles or even more. The mushrooms become very expensive, which is why you don't see them in the supermarket. They are allowed to grow at a slow natural pace, resulting in a highly flavoursome, firm textured product (unlike the mass produced supermarket button mushrooms). The pied bleu ('blue foot' or Wood Blewit Clitocybe nuda) is native to this area and can be found wild in the forest. However, grown in the caves they remain white and do not develop the violet colour, which is apparently a reaction to warm days. They also remain unmolested by fly larvae and slugs. Chefs love them because they retain a firm, almost crunchy texture when cooked, and will keep up to 10 days in the fridge in good condition. I've eaten them twice, and they are distinctive, particularly because of the way they retain their shape and the mouth feel. The first time I had them I cooked them myself after purchasing some fresh ones at the Cave des Roches. Later that evening I developed a headache and took a paracetamol/codeine tablet. Not long after I began to feel odd and thought I was going to pass out. My guess is that the mushrooms and the codeine had a disagreement. Combining alcohol and mushrooms quite commonly causes a reaction in people, and it seems likely that the same applies to codeine. I've since had them at the nice new restaurant in Montrichard, La Villa (where our friend Laurence works). They came with an excellent piece of steak, some Sainte Maure de Touraine goat cheese sauce and a glass of wine and I had no reaction whatsoever (except 'yum!'). The shitakes are grown in blocks of compressed sawdust. 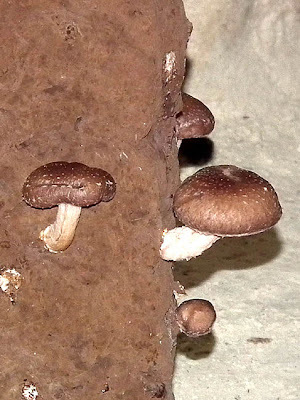 French chefs don't do much oriental style cooking so many of the shitake are actually produced for cosmetics and pharmaceutical companies. Like the pieds bleus, the grey oyster mushrooms (pleurotes grises) can be found wild here. They are not a great favourite with chefs because they go soggy very easily. 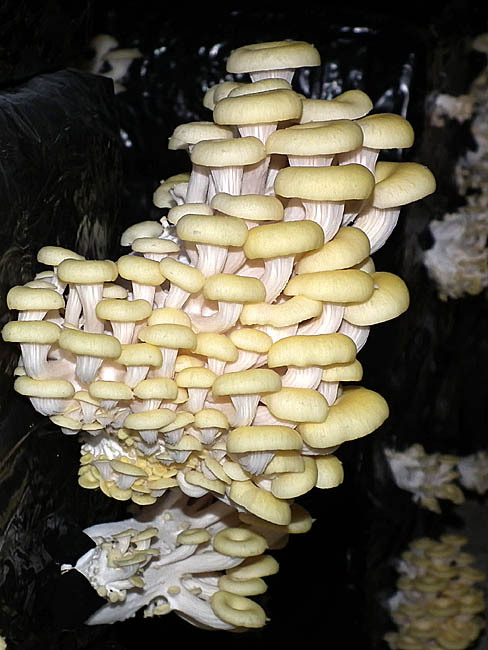 Consequently, the Cave des Roches also grows yellow oyster mushrooms (pleurotes jaunes) an oriental species. These are fragile too, only keeping for 2-3 days in the fridge, but if they are cooked very briefly they retain their firmness. The oyster mushrooms are grown in bales of organic straw covered in plastic. It is vital that the straw has not been treated with fungicides, pesticides or herbicides or the mushroom spores will be killed. The bales are inocculated and the mushrooms emerge like bunches of flowers through the inocculation holes. Once a 'bouquet' is ready it is picked and shortly after a new one will emerge. 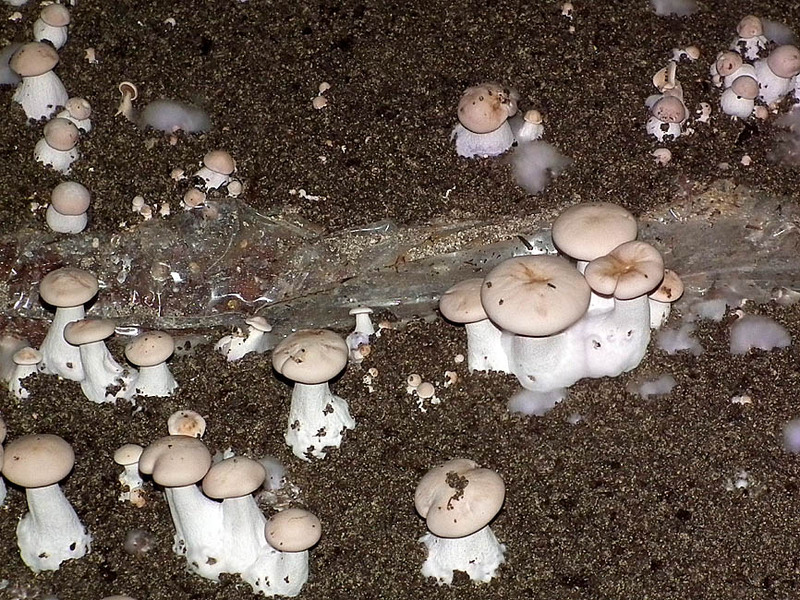 A few chestnut mushrooms are also grown, in plastic bags of pasturised horse manure set into metal crates. 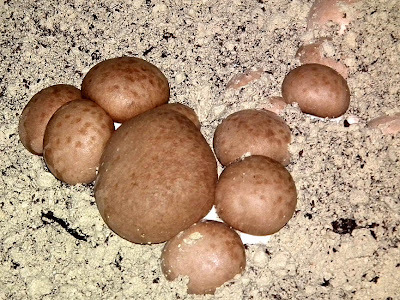 These are not so popular with the great chefs as they are now a bit run of the mill, not exotic enough, but they appreciate the quality of these traditionally raised mushrooms and so it is worth it for the Cave des Roches to continue growing a small quantity. It won't be many weeks until the grapes will be ready to harvest. As Jim Budd is fond of saying, it's squeaky bum time now. The weather is warm and wet, which means that fungal diseases are a very strong possibility even in the best managed vineyards. We've been told that the acidity is still quite high in the grapes too, so it may not be as good a vintage as the last few years. 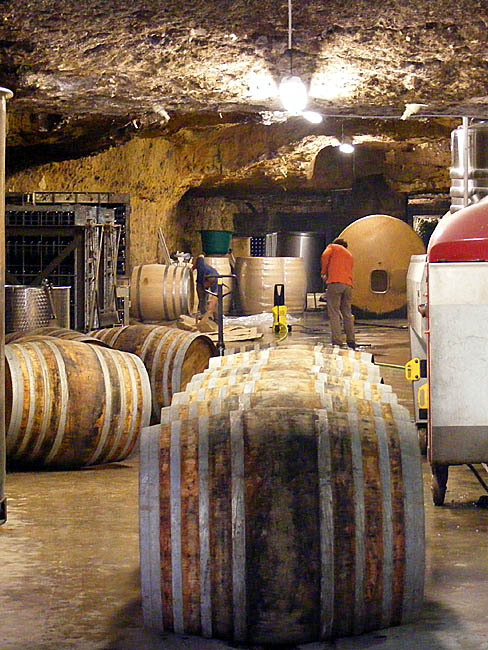 At Château Gaudrelle, like many other vineyards I've no doubt, they are busy making sure the winemaking facilities are clean and tidy in preparation for bringing in the grapes. Old barrels are moved aside so the floor can be cleaned, new barrels are unwrapped and checked for faults. 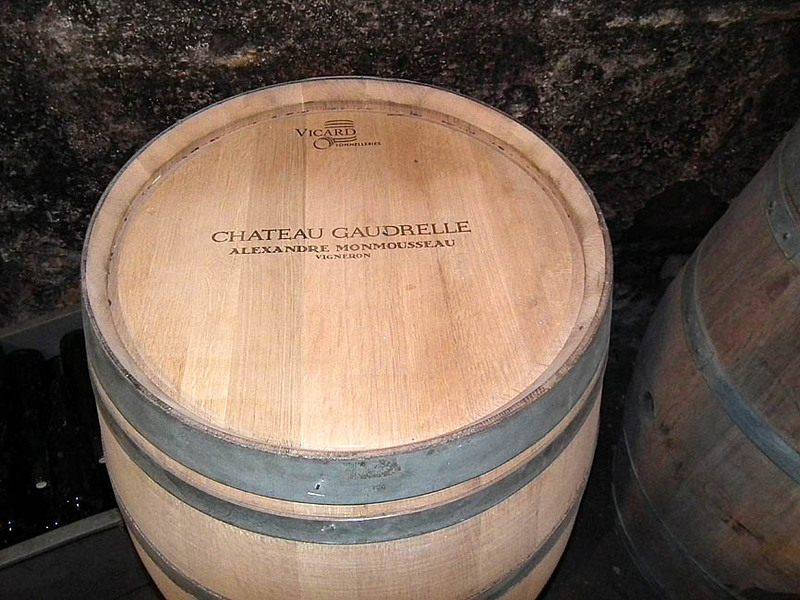 Gaudrelle has barrels made for them by Vicard, a family owned firm based in Cognac who have developed a special system for seasoning the inside of the barrels with heat. 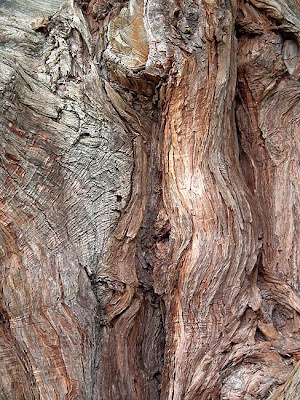 They use 75% French oak and are committed to sustainable production. in the neck of the bottle prior to ejecting it. 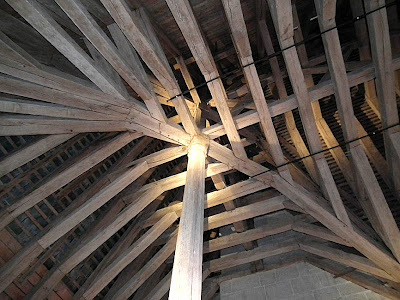 On visiting the château d'Azay-le-Rideau recently, we were delighted to discover that the attic space is now open to visitors. All this year les combles (a term that indicates useable, even occupied, attic space) have been the subject of a major restoration project. 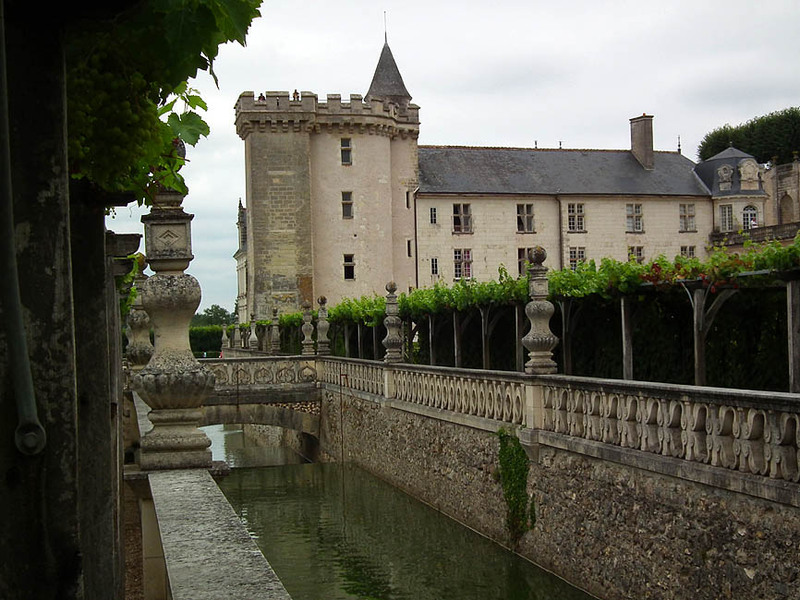 My contact at the château, Héloise, tells me that they have spent €700 000 and have two and a half months to go until the project is complete. What has been revealed is a truly magnificent space, with the most remarkable example of renaissance master carpentry now on show. The steeply sloping roof of Azay is covered in slate and punctuated by numerous highly decorated dormer windows, designed to accentuate the height of the building. Inside, the attic is constructed à surcroit, that is to say, the external walls which support the carpentry are raised well above the floor level, thereby creating much more useable space. It also had the important advantage of allowing easy access to the wall-walk, a defensive arrangement resting on the corbelled upper sections of the towers and walls. 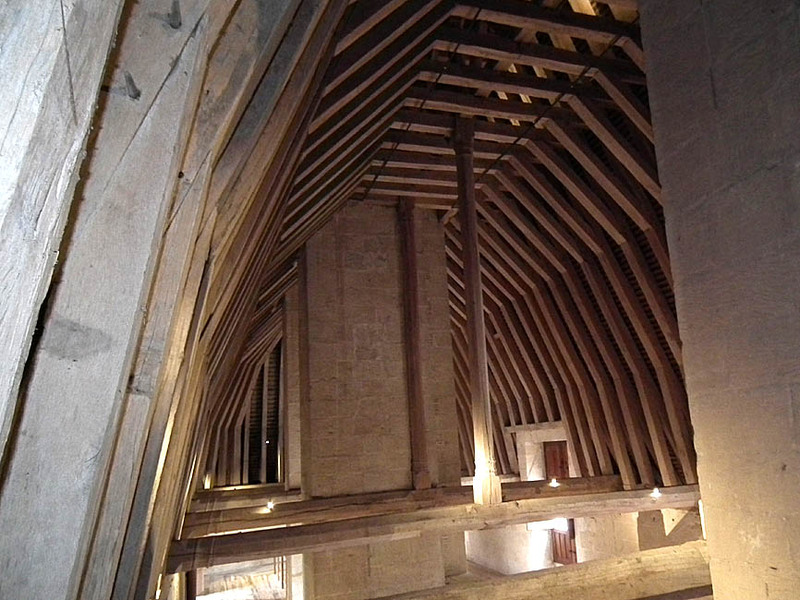 In addition, the extra height of the Great Hall below could be accommodated. The original carpentry is of a very high standard, with considerable care being taken in the choice of timber, methods of construction and finishing. The very tall oak trees were cut in the middle of winter 1518-19 and the construction probably undertaken in 1522. The structure is composed of a solid primary and secondary frame in a style known as 'rafter bearing'. The identical rafter sections measure 11.8m long. At the corners they radiate with monstrous precision. 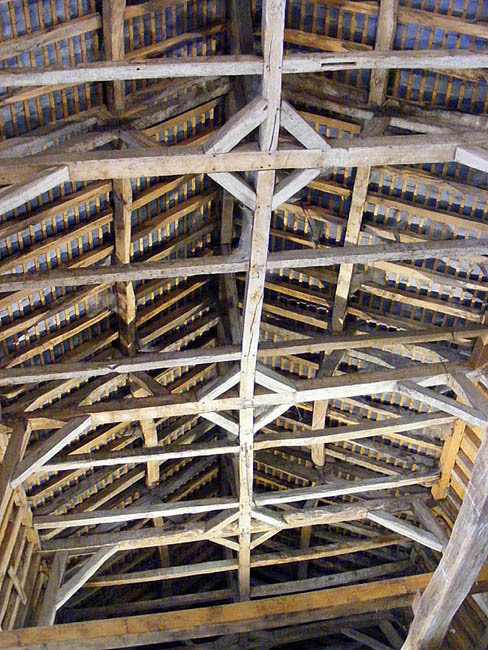 Two lines of sub-ridges filled in with St Andrew's crosses make a crossbracing against windshear along the whole length of the roof. 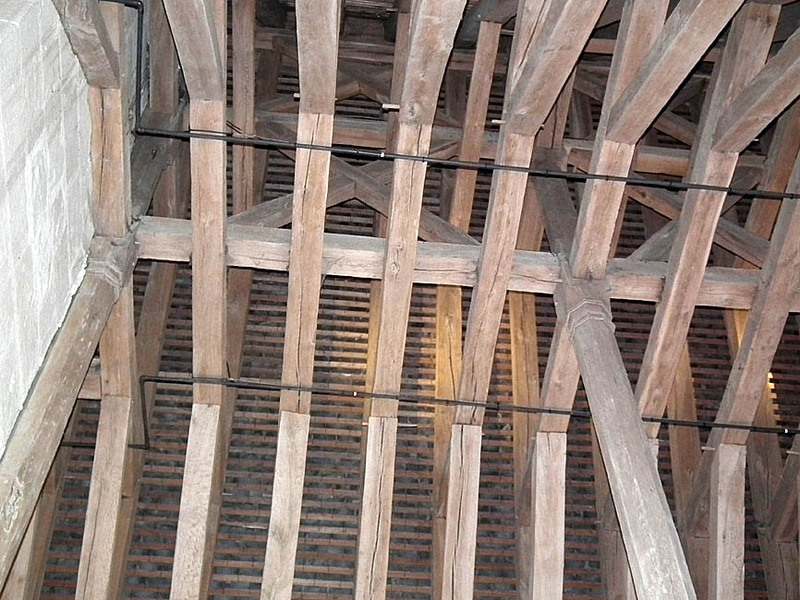 Elegantly shaped king-posts (the central verticals) and beams were also originally adorned with coats of arms at their junctions. 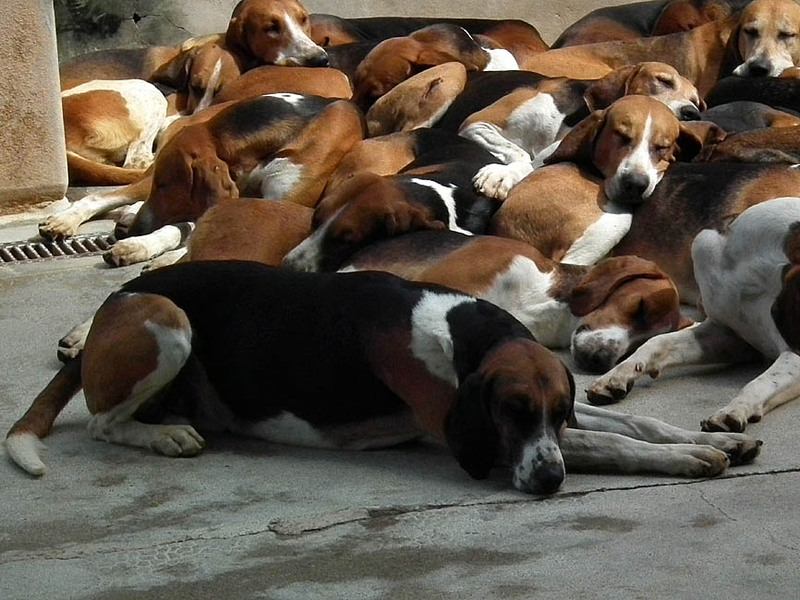 Nuthin much happens in August if you are a chien français tricolore at Cheverny. The hunting season is but a distant memory. You get to hang out with your mates and relax. It's hot, so you snooze a lot. Occasionally you might stir yourself and go over to the railings to be petted by a visitor. Everyone's so relaxed there aren't even the usual hierarchical jostlings. 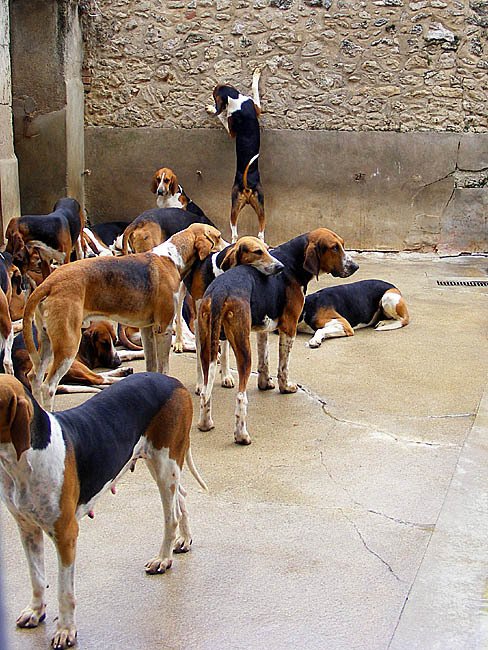 The only excitement, other than the mid-afternoon feeding, is when a small child throws a toy into the kennel yard. 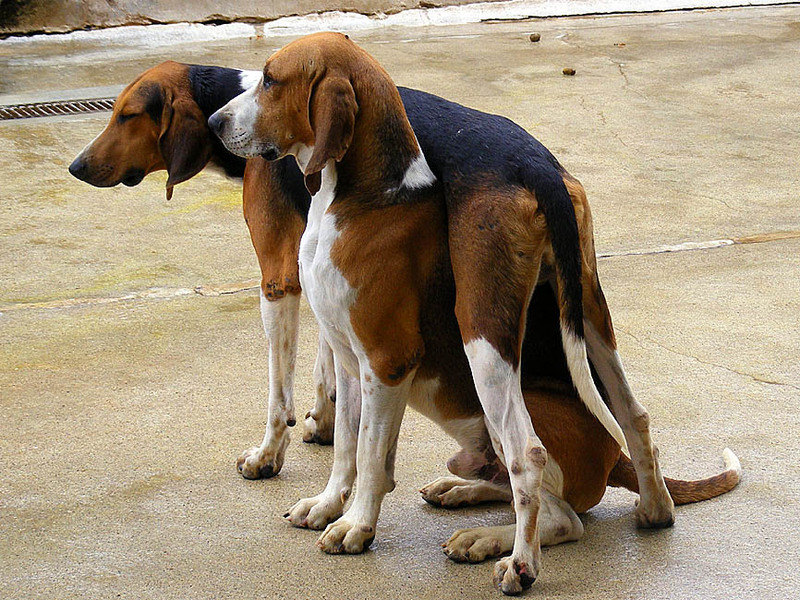 This causes a swirling of dogs, all convinced the object will be good to eat, and the kennel hand shouts and shoves his way through to retrieve it before someone has a chance to swallow it. Once peace is restored kennel hand tells me that there are 100 dogs in the pack and suggests I comptez les pattes et diviser par quart to verify this statement. 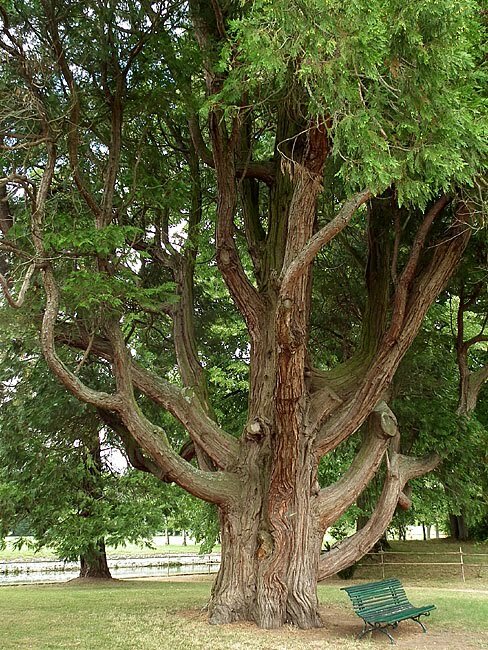 This rather lovely tree lives on the island in the Parc de Richelieu. 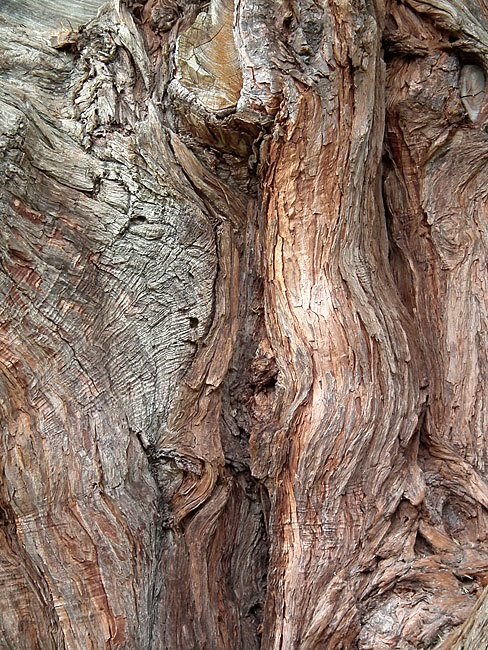 We found its twisting limbs and swirling bark patterns very photogenic. I think it's a Swamp Cypress, but no doubt one of our Richelieu readers can correct me if I'm wrong. I have been playing with the new camera, investigating some of its tricky stuff. One thing the camera does automatically (when set right) is remove those awkward, annoying people who walk in front of you when you're taking a photo (ably demonstrated here by Susan). Of course, you can do it yourself in Photoshop (or photo editing software of choice) but having the camera do it is easier, if not quite as effective. You do have to keep the camera almost still for the time you are taking the photos, in this case 10 seconds. Another of the functions is panorama, where you just hold the button down and move the camera from left to right through 270 degrees (or if you change the setting, right to left). Once again the result isn't perfect, but it isn't bad. I will probably continue to stitch together my own panoramic views, but compared to what my old camera used to present as a panoramic view it is a huge improvement. It will be interesting to see where all this technology leads to in the next generation of camera. What a Difference Some Rain Makes!